Top Agent Ivan Silva of Weicher in Newark, New Jersey has made a Realtor who can be trusted to pro service to every one of his grate Garden State. Whether the transa million dollars, each of his clients of attention and care, a fact that ha buyers and THROW A sellers. soever. I did know, however, that w always wanted to work for myself.” 26) 6 THINGS ALLAdministrator SUCCESSFUL immediately after fi NEGOTIATORS DO information technology left him fe in 2015 he obtained his license. Sin real estate career flourish. 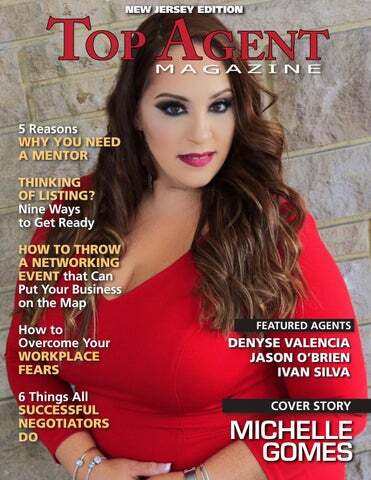 DENYSE VALENCIA Top Agent Denyse Valencia of Century 21 All Stars 100 in Teaneck, New Jersey has forged a highly-successful eighteen-year career in real estate through a commitment to providing each of her many buyers and sellers with top-notch, highly-personalized service. A former stay-at-home mom, Denyse began her foray into real estate as a property manager before segueing into a career as a Realtor. “It was an easy transition,” she says. Since then, she has firmly established herself as one of the most trusted and respected real estate professionals currently operating in The Garden State. With more than half of her business consisting of repeat clients and referrals, Denyse has clearly earned the long-term loyalty of her buyers and sellers. The reason for this, she believes, is the true concern she feels for her client’s well-being. “I do this from the heart,” she explains. “I always put my client’s needs above anything else. I strive very hard to get them what they want, what they need. That’s important because it’s not like buying a pair of shoes that they can return if they’re not happy. 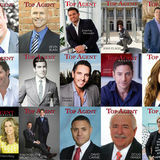 “I care too much about my reputation to deliver anything less than phenomenal communication and strong negotiation skills.” Top Agent Ivan Silva of Weichert Realtors New Group in Newark, New Jersey has made a name for himself as a Realtor who can be trusted to provide exceptional client service to every one of his grateful customers in The Garden State. Whether the transaction is for 100k or a million dollars, each of his clients receive the same level of attention and care, a fact that has endeared him to both buyers and sellers. Ivan’s career in real estate began almost accidentally. “It was an industry I happened to just kind of fall into, initially,” he says. “I had no knowledge in the field whatsoever. I did know, however, that when I was growing up I always wanted to work for myself.” Working as a Systems Administrator immediately after finishing up a course in information technology left him feeling undervalued, and in 2015 he obtained his license. Since then, he has seen his real estate career flourish. Ivan truly enjoys what he does for a living. “I love that I get an opportunity to impact the lives of families and play a role in their new chapter. I’ve always loved helping others with their challenges. I also love that every day is different. You never know what’s going to come.” Ivan also has big plans for the future: “I’d like to start my own brokerage and play a role in real estate development,” he says. When he’s not working, Ivan enjoys spending time with his loved ones. “They’ve been my biggest support system getting into the industry, and they keep me humble.” Ivan also gives back to his community through Weichert. “Our office deducts monies per closed transaction to give back to local churches, clubs, and organizations around the holidays,” he explains. it. Here’s a look at some traits that are common among expert negotiators. have an end goal in mind, and getting heated won’t help you meet it. If things don’t go your way, remember it’s not personal. Best to leave the table with no hard feelings. Hopefully even though you may not have gotten what you’ve wanted this time around, you’ve established a foundation for success at your next try. 2. They’re reasonable If you don’t ask for what you want you’ll never get it, but at the same time, you need to be reasonable about what you’re asking for. Yes, ask for a little more than you want, so you have some wiggle room to compromise. But if you ask for too much too soon, you might shut down the person you’re negotiating with from the start, or even worse offend them. No one wants to feel like they’re being taken advantage of. Ask for what you deserve and you’ll never go wrong. At the very least you might start the conversation on how that might be possible down the line, if it isn’t just yet. 4. They always strive for a win/win solution for everyone Yes, negotiations are about getting what you want, but as the old saying goes, you get more flies with honey than vinegar. Your negotiation partner might also have reasonable requests that you need to consider. Ultimately, successful negotiations are about compromise on both sides, and ending up with an outcome that benefits everyone. 5. They’re creative Problems and conflict are a natural part of any negotiation. One surefire way to impress, is to head off any impending roadblocks, by coming up with creative solutions. It’s easy to point out problems and be negative. Truly expert negotiators think outside the box, and dazzle with innovative concepts and ideas that leave everyone excited about the process. 6. They’re good listeners Listening in order to really understand where your negotiation partner is coming from is important for two reasons: you not only want to make them feel heard, but knowing what they want is invaluable information you can use to get what you want. At the start, you’re gathering information by asking questions and really hearing what they say, which includes picking up on body language and nonverbal cues as well. This is part of being well-prepared, using every possible thing you can to have an advantage. Being in control of the situation, and then leading everyone to a successful conclusion all around is what great negotiation is all about.